“In recent years,” writes TransAfrica executive director Randall Robinson in the preface to this volume, “there has been no graver moral-political crisis facing the world than apartheid.” For that reason, the prospect of representative democracy in South Africa ranks as one of the most extraordinary sociopolitical achievements of the late twentieth century. Throughout much of the era of repressive white rule, the United States has maintained a complex and often supportive geopolitical and economic relationship with South Africa’s notorious apartheid regime. As that regime comes to its inevitable end, the role of U.S. policy—from the Sharpeville massacre in 1960 to the release of African National Congress leader Nelson Mandela in 1990—can now be examined and understood. South Africa and the United States: The Declassified History makes available, for the first time, the most important internal U.S. government documents on U.S. policy toward South Africa over the last thirty years. Obtained by the National Security Archive through the Freedom of Information Act, this rich and revealing collection includes formerly top secret presidential decision directives, CIA memoranda, State Department policy papers, embassy cables, Defense Intelligence Agency assessments, and other recently declassified documents. Taken together, they dramatically record years of U.S. efforts to prop up the Afrikaner regime, and the evolution of Washington’s policies in the face of mounting domestic and international opposition to the world’s last racially based political system. Among the many revelations in this remarkable volume are details of the Reagan administration’s secret propaganda plan to defuse public and congressional support for economic sanctions; the U.S. role in the development of South Africa’s nuclear weapons capability; and Henry Kissinger’s controversial diplomatic and covert campaigns throughout the southern African region. 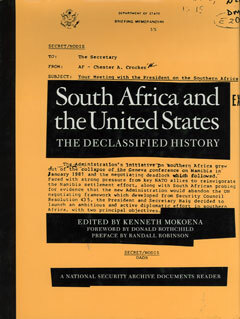 The context for the declassified documents in South Africa and the United States is provided by concise, authoritative essays on U.S. sanctions policy, the history of nuclear collaboration, and U.S. reaction to upheavals in Angola, Mozambique, and elsewhere in the region. To supplement the narrative and the documents, the volume also provides an in-depth chronology and comprehensive glossaries. The result is an accessible and intriguing documentary history of one of the most significant international issues of our time.